Join me live around 8pm ET on YouTube to discuss this week’s tips. The BlogAid Live Show returned with a Bang this past Friday! I could not have planned a better topic or panel than what organically transpired. for jumping on air to discuss what the future holds for both site owners and designers. And thanks to everyone who watched the show live and contributed in the live chat too. We had a look at a lot of different sites and solutions and you’ll find the links to all of them in the show notes as well. I do like winding up our crazy weeks on Fridays. But Barb let me know that my show is scheduled opposite the Social Media Examiner show, which I have been catching in replay, so wasn’t aware of the time. I’ll be bumping my show time around to find a better spot. I’m thinking 11am ET / 8am PT. That would also be better for my international audience too. When is a good time for you on Fridays? Your suggestions are most welcome. Leave a comment on the blog or anywhere you see this post online. Thank you so much for subscribing to my YouTube channel!!! We’re at 761 on our way to 1000 and I appreciate you helping me meet that goal. And I hope you saw the little video I made on how to click that bell and get notified when I go live or upload a video. And I’m really enjoying those notifications more now too!! I didn’t know about clicking that bell. I’ve been able to catch so many more livestreams from my buddies like Ileane Smith and Krishna De and Larry Snow, all of whom I hope you subscribe to as well because they have super helpful tips for you too. I’m doing my best to line up interviews with my site audit clients because we’ve had some tremendous success with their sites since getting them all fixed up. And all of that is making and saving more money for my clients. In other words, the audits are paying for themselves and then some. We tried Zoom, but honestly, the video and audio quality is just not at a high enough level compared to doing them on YouTube Live. But, most of my clients don’t have a USB mic and want to call in. So, I’m looking into video calls like HOAs had to see how well that works. YouTube and HOAs are a little more complex for my clients to get into as well, so there’s another hurdle. However, YouTube Live is a great place for me to bring back interviews with my expert buddies because they are very familiar with that platform and HOAs. So, be looking for those soon on the BlogAid Live Show. What kind of topics would you like to see come to the show? Leave a comment here or anywhere you see this post online. Thanks to all of my top-tier site audit clients for your feedback on the recent survey and invite I sent you for our new group. You gave me some really good naming ideas and I looked those up for our new Facebook group name. Many of them were already taken, so I dusted off the thesaurus and found something that I think describes us to a tea. Are ready to participate in a mastermind setting where everyone is supportive and helps each other meet their online goals. I can hardly wait to open this opportunity up for us next week. Now, if you’re a site audit client and didn’t receive an invite, don’t feel slighted. This is a pilot program and I’m taking what I learn from this to start more groups for newer site owners so that the group activities and info are more tailored to where you are in your online journey. So, just be patient with me as I work out the details and tailoring of the programs. And, I’m delighted to tell you that I’ll be launching a webinar for webmasters and the public the second week in July for how to set up a site from scratch and fully secure it. I’ll be doing it right in front of you, so you’ll get to see all the steps involved. This is a must-have skill for all designers and those who maintain client sites. And, you’ll be able to apply many of the security features to existing sites as well. So, it’s not just for new sites. You’ll earn money from having this value-added service to offer immediately after the webinar. Plus, it’s a low-cost introduction to the types of profitable skills you can learn in the Webmaster Training courses too. Just ask any of the webmasters in the course how much more money they’ve made. You can see their testimonials on the home page. I’ll have more details for you soon. At some point in the near future, WP devs intend to do away with the TinyMCE text editor and replace it with a new editor they call Gutenberg. It is their first attempt at a drag and drop editor too, so it’s very basic right now, but promising. I’ll be doing some in-depth tests on it now that they have a plugin available for it, and will be making a video tour for you. I strongly recommend that you do not install this on a live, production site!!! It’s still a major work in progress and not ready for prime time yet. But, if you are a designer or developer or trainer, you definitely want to set this up on a sandbox site now and get to know all you can about this plugin so you can keep ahead of the curve with what’s coming. For now, you can also see a written review from Matt Cromwell with his first impressions of it. And see this video tour from the WP Munich site. As many of you already know, Automattic, which is the parent company of WordPress.com, Pressable hosting, Vaultpress, Gravatar, and Jetpack, also acquired Woocommerce a couple of years ago. Woocommerce is considered by many to be the most extensible e-commerce solution that you can natively integrate with WordPress. The core Woocommerce plugin is free and they make their money via paid extensions. There are at least 300 free and paid extensions directly from them, and 100s more in the open marketplace. So, even though the core plugin is free, you really do need extensions to make it fully functional or integrate it with other parts of your site and purchase system, so this is going to cost store site owners a little more every year. The folks at WPMayor state that this opens the door to a huge opportunity for a new dev company to create their own extensions and support at the reduced rate. To me, it seems like it’s an open door opportunity for Shopify and other standalone store services to swoop in and take a bigger chunk of the pie away from WordPress. But, as the article states, there are millions of site owners already locked into the Woocommerce way of doing things. Depending on store size, it may cost a small fortune to switch to another platform. And I’m betting that’s what Automattic is counting on with this new way of generating more income to pay for current support and even more future development. If so, how many extensions do you use, and are they free or paid or both? Please leave a comment here on the blog or wherever you see this post online. I want to thank webmaster John Sawyer for bringing this post to the attention of our Webmaster group. I love shortcut keys. As an electronics engineer, I worked on mainframes when you had to program in hex with toggle switches. We about lost our minds when we could type commands. And then when shortcut keys became available, I was all in. A mouse is cool, but I still strongly prefer shortcut keys and I find them way faster. You probably will too, if you can just stick with using them for a week to get the hang of it. And HongKiat has a list of 50 of them to use on your WordPress site. Just scan the list for the things you do most and start there. In last week’s Tips Tuesday I talked about image optimization being one of the biggest bangs for the buck for speeding up your site. Several of you contacted me about the mention of bulk image optimization services. I do have a team member for that, but I’m only making him available to site audit clients at this time. Well, if you have a small number of images, perhaps you can do your own replacement with the Replace WordPress Images plugin. Basically, it substitutes a new image for an existing one, while retaining the file name and permalink. That’s basically what bulk image optimization is all about, but it can handle thousands of images at a time. It would just be too labor intensive for you to do that one at a time with each image. First you’d have to manually optimize it, then manually exchange it with this plugin. But, if you just want to do your logo or sidebar images or such, perhaps this would be a good option for you. The only bug type report I saw on it is that you need to clear your cache in your browser and on your site to see the new image. Okay, so you’re writing blog posts and sharing them on social media. Great! But, tracking how well they are doing is a pain. It’s not easy figuring out all the different analytics tools for each platform. 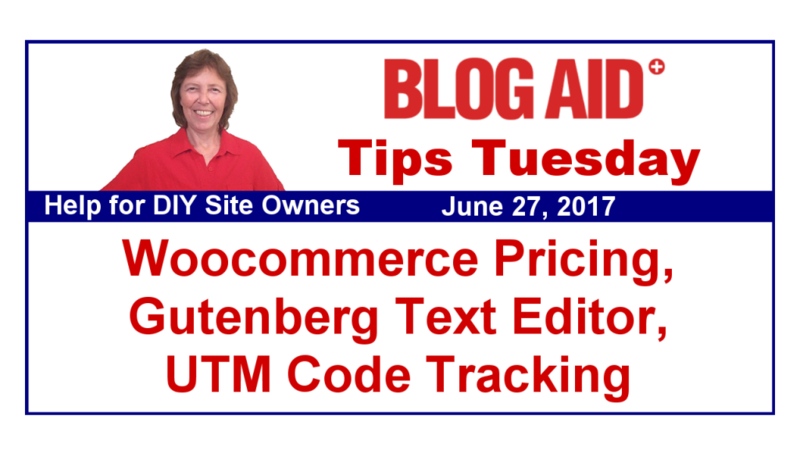 Instead, go watch this nice tutorial by webmaster Larry Snow on how to create UTM codes so you can track your shared links in Google Analytics. Denise Wakeman first got me interested in UTM codes. And she got interested in them from David Kutcher, who is a Google Analytics guru in my book. This is definitely something I’ll be digging into this summer. For years we’ve heard about how “this will be the year of mobile.” And that finally hit about 3-4 years ago, aournd 2013. Google has been pushing on us with penalties and perks to ensure we have sites that work well on the small screens of mobile phones. Now that most site owners have transitioned to responsive themes, Google is ready to get serious with its Mobile First indexing of sites. That means a separate display of search results when Google detects that you’re doing a search from your phone. You’ll only see listings of sites that will display well on that device. And considering how many folks search on their phones now, this is huge. So, you want to ensure you’re site is ready and will retain its ranking in this new index. First, have a look at this quick post on SEO Roundtable with Google telling folks to ensure their desktop and mobile sites are equivalent. In other words, if you still run an old m dot version of your site, migrate it to a responsive theme instead. That also counts if you’re running a different version of your site via a plugin like WP Touch. Now, I know some of the ad networks used to provide a separate version of your site for mobile too. And some folks have not asked to switch off of that, at least that’s what I see in site audits, but there are fewer of them now. So, if you’re in that boat and stuck with a separate mobile version because something didn’t work right when you came off it, now would be the time to invest a little in a webmaster or developer and get that fixed so you can have only one version of your site before this indexing happens. Second, read this post on SEM Rush. It’s a whole guide on SEO for 2017. Scan down to the mobile first section to get more details on what you should be doing to ensure you’re ready for this indexing. Joshua Strebel, who is the CEO of Pagely, which was one of the first managed hosting services, has a nice guest post on Post Status. I believe this is in response to a video made by Chris Lema that I mentioned last week about the shrinking of the WordPress economy. Joshua has a very different take on it. I agree with him that everything about the web is maturing and niches are getting saturated. In fact, that’s a specific pivot point for BlogAid this year and the reason I’m launching the Booming Bloggers Hub. That’s the uphill battle I fight at BlogAid every day. I’m constantly banging my head against the wall of site owner beliefs that are still stuck in 2013. Joshua also cites the natural ebb and flow of the market. David Kutcher also alluded to the expansion and consolidation of the entire online community in our BlogAid Live show on Friday. Joshua also states that there is still plenty of growth happening, but it seems to be centering around established leaders. I think a lot of my niche blogger followers can relate to that too. It’s getting harder and harder to break into the spaces with so many niches over saturated as it is. Same with webmasters and designers. And with so many DIY design products and theme builders now, that pie is getting cut into even more. And that’s just one more reason why bloggers and designers need to expand their methods and skills to set themselves apart from the pack. That’s where BlogAid comes in. And I think I’m pivoting this business to stay ahead of the curve and the writing on the wall. It’s just that I’m usually way ahead of that curve, by like 2 years. So, I see a drop in current offerings before the new ones hit critical mass. But, the smart folks are seeing the same signs as me, and doing what they have to do to keep on top of the game too. What do you think about the online marketing space, from blogger to designer and everywhere in between? Please do leave your comments here on the site or wherever you see this post online. Well, as factual as it can be. WordPress openly states that it powers 28% of all sites. It powers 28% of the top 10 million sites as ranked by Alexa. That’s a 59% market share of all CMSes in use. Wix powers 3% of those 10 million sites and holds a 0. 7% market share. And that may explain why they are spending $160 million on ads now. They want a bigger piece of the pie. These stats are from the Web Technology Surveys site. So, not only do they just count the top 10 million, they don’t count sub-domains of those. All of this in part is to control domain spammers from skewing the data. Also keep in mind that the majority of free sites on WP.com are also sub-domains, so that excludes the bulk of them too. According to Internet Live Stats, there are 1.2 billion sites on the web. So, the 10 million at the top is a tiny fraction of those. To be exact, it’s .83%. And WordPress powers 28% of that fraction. So, now when you hear that stat of WP powering 26-28% of the web, you’ll have some idea of just how different a number it is to consider all sites compared to the top 10 million. A post on Rarst worked out the same numbers and concludes that WordPress is on less than 10% of all sites on the web. A much more impressive number is that WordPress holds a 59% market share of all sites that use a CMS (Content Management System). Nothing else even comes close, by a long shot. The next one down is Joomla, with a measly 6.9% market share, and it dwindles significantly from there. Wix only has a 0.7% market share. So, even with their ad spending of $160 million a year, they’ve got a very long way to go to catch WordPress. Thanks for letting me know Andy! Sounds like your Fridays are full up on HOAs. Great summary of tips for people who want to optimise their blogs – as usual. Thank you – and also many thanks for including me in your comments about YouTube notifications. Always happy to include the good stuff, Krishna!! !